Procellera® by Vomaris Wound Care, Inc.
Procellera Antimicrobial Wound Dressing is indicated for superficial wounds such as minor cuts, scrapes, irritations, abrasions, and blisters. Procellera is powered by an embedded matrix of moisture-activated microcell batteries that generate an electric field. Available in single layer and self-stick composite configurations. Customizable single layer dressings allow for application on diverse wounds. 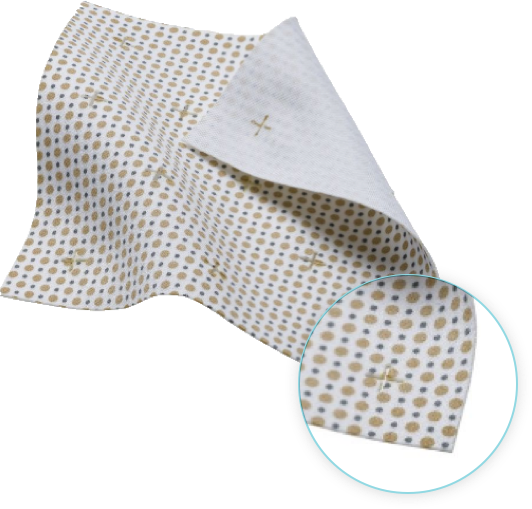 Water resistant self-stick composite dressings absorb excess wound drainage and enable maximum mobility. Based on firmly established principles of the essential role electricity plays in regeneration and healing, Advanced Microcurrent Technology has utility across a broad-spectrum of applications. Become a partner in advancing microcell battery-generated electricity to power improved healing and the future of performance and recovery.